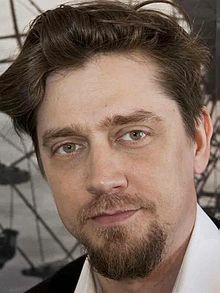 Andrés Muschietti (Spanish: [musˈkjeti]; born August 26, 1973) is an Argentine film director and screenwriter, best known for directing the 2013 horror film Mama and the eponymous 2017 adaptation of Stephen King's novel It. He is brother of Barbara Muschietti, who works as producer on his films. In 2013, Muschietti directed his debut film, the supernatural horror Mama, which he co-wrote with Neil Cross and his sister Barbara Muschietti, with the latter also acting as producer. It was based on Muschietti's three-minute short film Mamá, which attracted Guillermo del Toro, who stated that it had the "scariest" scenes he had "ever seen." The short convinced del Toro to executive produce the feature-length film, which starred Jessica Chastain, Nikolaj Coster-Waldau, Megan Charpentier and Isabelle Nelisse, and was released by Universal Pictures on January 18, 2013. The film grossed more than $146 million and had a budget of $15 million. In September 2013, Universal hired Muschietti for a reboot of The Mummy franchise, but he left the project in May 2014 due to creative differences with Jon Spaihts' draft of the script. In July 2015, after the departure of Cary Fukunaga, Muschietti was hired by New Line Cinema to direct It, an adaptation of the Stephen King novel. Barbara produced along with Dan Lin, Roy Lee, Seth Grahame-Smith and David Katzenberg. The film will be in two parts. In February 2013, Universal Pictures announced Muschietti would direct the film adaptation of the Josh Malerman novel Bird Box, which Scott Stuber, Chris Morgan and Barbara would produce, with Eric Heisserer set to write the script. In January 2014, Muschietti was reportedly among front-runners to direct a He-Man film for Warner Bros., a remake of Masters of the Universe. In June 2014, Deadline reported that Muschietti was on the shortlist of directors to direct a sequel to the fantasy film Snow White and the Huntsman for Universal. In September 2014, Sony Pictures named Muschietti to direct the film adaptation of Shadow of the Colossus after Josh Trank left due to a commitment to an upcoming Star Wars spin-off. Barbara would co-produce the film with Kevin Misher, with Seth Lochhead set to write the screenplay. In February 2015, Deadline reported that Sony was looking to hire Muschietti to direct a live-action Robotech project, with Gianni Nunnari and Mark Canton attached to produce, and Michael B. Gordon as screenwriter. In March 2015, Plan B Entertainment optioned the film rights to Stephen King's short story The Jaunt from the Skeleton Crew collection, with Muschietti to direct and Barbara attached as producer. On October 29, it was announced by Warner Bros. Pictures, that Muschietti will be directing a live-action reboot of Attack on Titan. Muschietti's sister, Barbara Muschietti, is also a film writer and producer. He is of Italian-Argentine ancestry. ^ "Mensaje de Andy Muschietti". September 8, 2017. ^ Chang, Justin (January 15, 2013). "Mama". Variety. ^ Rolfe, Pamela (April 17, 2013). "Bittersweet Results for Spanish Box Office in First Quarter". The Hollywood Reporter. Retrieved July 17, 2013. ^ Tartaglione, Nancy (May 5, 2013). "Studios Translate Local Language Movies Into Lucrative Global Business". Deadline Hollywood. Retrieved July 17, 2013. ^ a b Couch, Aaron (December 29, 2012). "Guillermo Del Toro Plugs 'Claustrophobic' 'Mama' Short (Video)". hollywoodreporter.com. Retrieved July 17, 2015. ^ "Universal Eyes 'Mama' Sequel Although Director Andrés Muschietti Isn't Interested". hitfix.com. February 20, 2013. Retrieved July 17, 2015. ^ "Mama (2013)". boxofficemojo.com. Retrieved July 17, 2015. ^ Kit, Borys (September 13, 2013). "'Mama' Director in Talks to Helm 'Mummy' Reboot for Universal". hollywoodreporter.com. Retrieved July 17, 2015. ^ Sneider, Jeff (May 6, 2014). "'Mummy' Reboot Loses 'Mama' Director Andy Muschetti". thewrap.com. Retrieved July 17, 2015. ^ Kit, Borys (July 16, 2015). "Stephen King's 'It' Finds New Director (Exclusive)". hollywoodreporter.com. Retrieved July 17, 2015. ^ Kit, Borys (February 26, 2013). "'Mama' Director to Helm Adaptation of 'Bird Box' (Exclusive)". hollywoodreporter.com. Retrieved July 17, 2015. ^ "Eric Heisserer In Talks To Adapt 'Bird Box' For Universal". Deadline Hollywood. July 16, 2013. Retrieved July 17, 2015. ^ The Phantom (January 10, 2014). "He-Man and the Masters of the Universe Close to Happening; Looking at New Directors!". Schmoes Know. Retrieved July 17, 2015. ^ Fleming, Jr, Mike (June 4, 2014). "'Huntsman 2' Helmer Short List: Frank Darabont, Gavin O'Connor, Andy Muschietti". Deadline Hollywood. Retrieved July 17, 2015. ^ Kroll, Justin (September 4, 2014). "Andrés Muschietti to Direct 'Shadow of the Colossus' Adaptation for Sony". Variety. Retrieved July 17, 2014. ^ Fleming, Jr, Mike (February 4, 2015). "Robotech Movie Back With Hollywood Gang, '300' Scribe Michael Gordon". Deadline Hollywood. Retrieved July 17, 2015. ^ Fleming Jr, Mike (March 12, 2015). "Plan B Takes 'The Jaunt' With Stephen King And 'Mama' Helmer Andy Muschietti". Deadline Hollywood. Retrieved July 17, 2015. ^ Harding, Oscar. "Mama: Interview With Director Andrés Muschietti". whatculture.com. Archived from the original on March 4, 2016. Retrieved July 19, 2015. This page was last edited on 9 March 2019, at 04:35 (UTC).